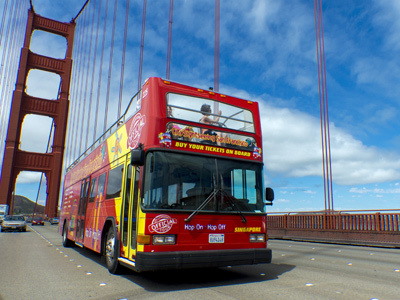 Big Bus Tours aims to give you the most enjoyable and memorable experience of San Francisco. Our unique city tour stops at 20 key points of interest all around this spectacular city, including crossing the Golden Gate Bridge. Witness the diverse culture, beautiful parks, stunning architecture and picturesque views atop an open air double decker bus. Hop on and off at your leisure to create your own customized journey around San Francisco. You have the choice of an entertaining live commentary or a personal recorded commentary available in 10 languages. 24 hour/48 hour tickets are available. Big Bus Tours also offers Walking Tours, a Panoramic Night Tour and a Sausalito Tour. City Sightseeing is the world's leading brand for Hop-On Hop-Off Tours, operating in more than 100 cities and 32 countries. See all landmarks of San Francisco from the top of Double Decker Bus with live narration. Choose between 5 different routes or combine them into one value package with unlimited hop-on hop-off use for 24, 48 or 72 hours. See Downtown of San Francisco, Golden Gate Bridge, Golden Gate Park, Fisherman's Wharf and much more! City Sightseeing also offers tickets to various museums and attractions , including Bay Cruises. Outside of San Francisco, tours include Muir Woods, Wine Country, Monterey & Carmel and Yosemite National Park. 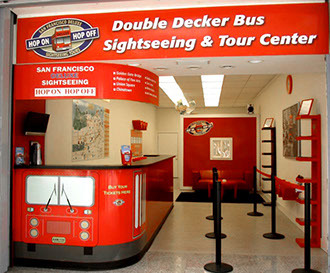 Founded in 2007, San Francisco Deluxe Sightseeing Tours has grown to be one of the top sightseeing companies operating in San Francisco today. The company’s outstanding success is based on the concept of providing the highest level of customer service to each visitor during their stay in the city. Offering Sightseeing Tours of San Francisco and the Bay Area. At Tower Tours, we take pride in providing personalized customer care. We have a modern and luxurious fleet of vehicles, as well as professional and talented guides and drivers available for our customers. We sell dynamic and memorable touring experiences at reasonable and competitive prices.